Japan’s fisheries minister said Tuesday his country will never stop hunting whales, despite fierce criticism from other nations and violent clashes at sea with militant conservationists.”I don’t think there will be any kind of an end for whaling by Japan,” Agriculture, Forestry and Fisheries Minister Yoshimasa Hayashi told AFP in an exclusive interview. Hayashi, who took the ministerial post overseeing the country’s whaling programmes in December, said the criticism of the practice is “a cultural attack, a kind of prejudice against Japanese culture”. There is “a long historical tradition about whaling”, he told AFP in his large central Tokyo office, over which portraits of Japan’s revered Emperor and Empress gazed down. “Japan is an island nation surrounded by the sea, so taking some good protein from the ocean is very important. For food security I think it’s very important. “We have never said everybody should eat whale, but we have a long tradition and culture of whaling. “So why don’t we at least agree to disagree? We have this culture and you don’t have that culture,” said the 52-year-old, who views the whaling port of Shimonoseki in Japan’s southwest as home. “In some countries they eat dogs, like Korea. In Australia they eat kangaroos. We don’t eat those animals, but we don’t stop them from doing that because we understand that’s their culture,” Hayashi said in fluent English. In the latest clash, on Monday, veteran anti-whaling campaigner Paul Watson said the Japanese factory ship, the Nisshin Maru, rammed the Sea Shepherd’s much smaller vessel, the Bob Barker. 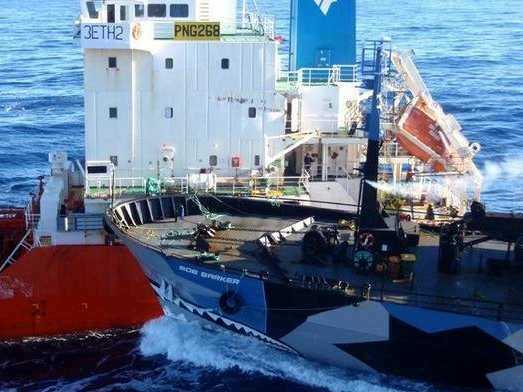 But on its website, Japan’s Institute of Cetacean Research said several Sea Shepherd boats had slammed into the Nisshin Maru as the vessel attempted to refuel from her supply tanker. “It was five hours of intense confrontation,” Watson told AFP from on board the Sea Shepherd vessel the Steve Irwin. The Institute of Cetacean Research said the Japanese vessels were “again subject to sabotage by the Sea Shepherd ships Steve Irwin, Bob Barker and Sam Simon”. “During their obstruction to refuelling operations the Sea Shepherd vessels rammed into… the Nisshin Maru and the supply tanker,” it said.